Visit Nail Studio is a place you’ll never want to leave. Renee Marella has created a nail studio not quite like any other I know. Visit Nail Studio offers a full line of nail services, as well as brow waxing and make-up artist services. But it’s more than that. It’s as if Renee has opened up her living room for everyone to visit, while she and the other professionals there pamper you. Let’s Visit: The experience begins the minute you walk in. It’s so welcoming, with comfortable chairs, beautiful art on the walls, and a stylish yet relaxed decor. Everyone inside is smiling or laughing. It’s a space full of conversation, with bursts of laughter and moments of quiet. It’s a group of friends getting together to catch up, share stories, relax, and of course, look their best. The Experience: Pedicure clients sit in comfortable chairs while they soak their feet in large copper bowls. They enjoy their treats or coffee from the coffee house next door, or even sip a martini offered by the house. (Yes. I did say martini.) They relax as Renee scrubs, massages and transforms their feet before applying the perfect color. The manicure clients receive the same special treatment. It’s one hour of personal attention and pampering they want to experience again. Natural Beauty: All the products in the studio are natural. No odd smells or nasty toxins in the air. Renee loves colors, and has a special knack for selecting and stocking a wide array of beautiful and unique nail colors. She can also help you decide what color to use. She’s got an uncanny sense of what will make your nails sparkle and you smile. Color Magic: In fact, Renee is also a color consultant. She says she picked up her talent for colors from her mother, and has loved working with colors her entire life. She designed the interior of her studio, and it’s obvious she’s talented, with a great sense of style. The space is clean, warm and stylish, while also a very comfortable place to be. Although the space is roomy, the studio is intimate, with room for only a few clients at a time. Welcome! 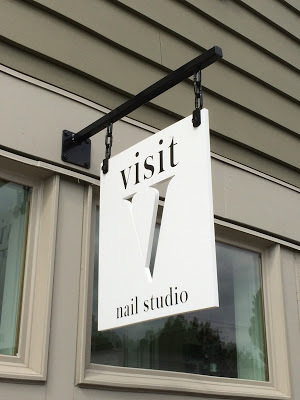 : Renee wants her nail studio to be like the Cheers of Irvington. I think she has achieved that. 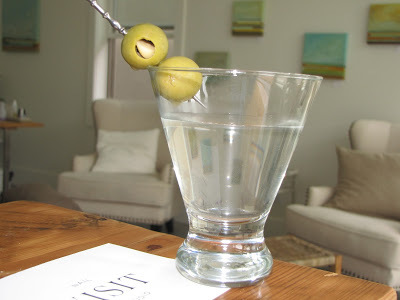 It’s definitely a place I’d like to come after a day of work and enjoy a martini while having a manicure. Apparently, other people feel the same! While I was there a client showed up early and just sat down and chatted with us, like it was an everyday occurrence. About Friendship: Renee says about 70% of the clients are repeat clients, many from the Irvington neighborhood. Although the studio welcomes walk-ins, during the summer the place is booked up solid. I know! I had to wait 6 weeks for the long overdue pedicure appointment. I think Renee revels in the repeat business, but not just because it’s good for the books. I think it’s good for her soul. She loves befriending her clients, hearing their stories, and sharing their laughter. The Team: Renee has brought in a few other top-notch professionals to the studio. First, there’s Charmaine, with whom Renee has worked before. Charmaine is another amazing nail professional with a flair for colors. Then there’s Monica and Joni, the make-up and brow artists who came over from Nordstrom. Together, they all create a family of sorts, who is there to serve the client. At Home: Renee has been in the nail business for many years. After working as an independent contractor in top nail studios in town, Renee decided it was time to open her own business a few years ago. I don’t think she’s looking back. The studio is an obvious success, and she’s happy.